Update 27-02-2016: I have stopped working on this project, and therefore i no longer support the code/schematic and printed circuit board. e circuit board was designed to fit to a Aluminium U profile. Just make sure you don’t try to cool down the power from a 9 map solar panel, with this small aluminium Profile. To do that, you need a bigger cooling plate. You can find a link in the article below for an example of how to use a salvaged pentium 4 cooling plate. 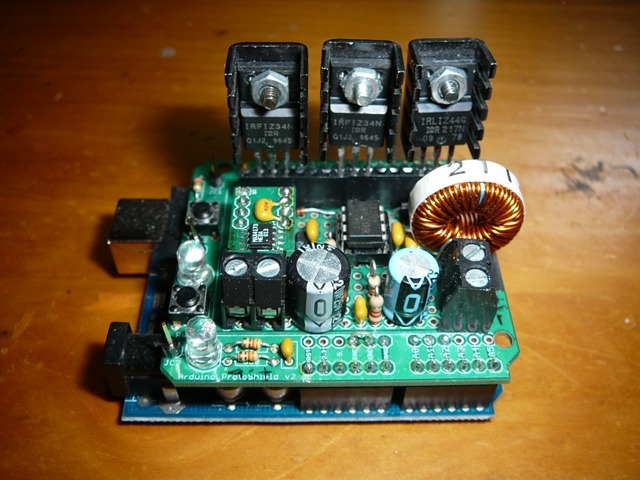 This project is inspired but the original Peak Power Tracker Battery Charger Project made by Tim Nolan. Unfortunally he’s website is down, so i will try to recover the specs and bilding material from his page. The mppt solar charger with arduino is designed so a 12V (20 volt peak) solar panel can do the charging of a 12V lead acid battery. Tim Nolan used a Arduino Duemilanove development board, in this project i have used both Duemilanove and Uno (r3) as the basic platform. 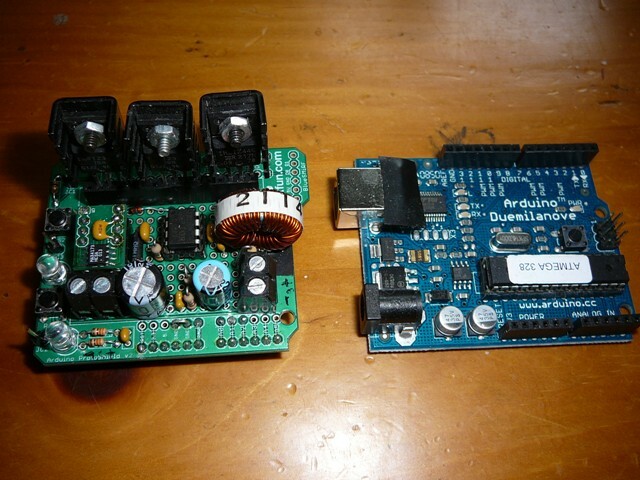 Tim Nolan used a Arduino Protoshield Kit for he’s development, i did that in my first version, but i became more and more happy for this project, and desided to make my own pcb layout based on Tim Nolan’s original project. hey admin. 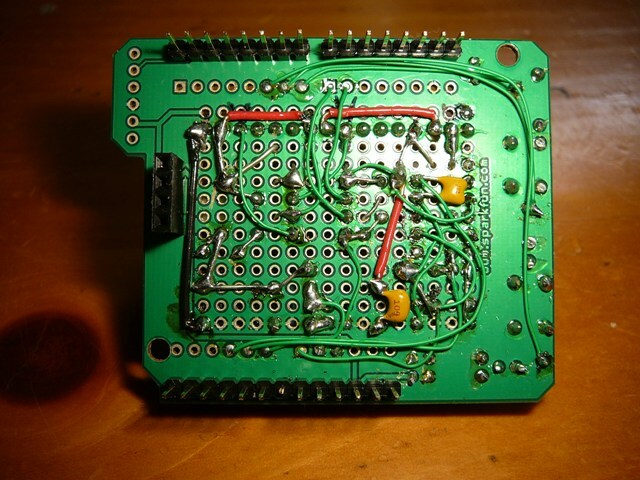 i jsut downloaded the pcb layout., is there any error in pcb layout? are there still faults in the pcb? We have downloaded the Eagle file and would like to use the pcb for a school project. We have also found out, that you have made some pcbs. thanks a lot for the reply. Your Eagle files will be a big help for us to make our first Arduino project work. Of course there will be some PCBs left over. So we will call back when they have arrived. post from china has just arived. They have send 12 beautifull PCBs for about 22Euro. Can you see the email adress i have offered above? So please send a note with your adress for shipping some of the PCBs we did not need. Thanks again for your great work. I am curious to hear where you ordered it, it sounds like at great price. I have read you were ordered ready board from the ‘Chinaman’, is possible you can share the supplier that I can order a few samples from they too? I need Eagle design of your MPPT solar charge controller. please provide me as soon as possible. Hi, great thx for work that you and Tim Nolan have done. What is max charge current(i understand, that good cooling = more current, what is max charge current you have tested)? sorry for stupid questions, but i think i’m not only one who interested them about. Great quistion. The max charge current are defined by more things: cooling, the mosfet used /amount of mosfet’s, the coil, the pcb layout. I played with another version of this mppt a few years ago, and i se no problem getting more than 8 amps from that design. I used more heavy MOSFETs, a home made coil, and thick wires, and no PCB layout. can i use this to mosfet? and the coild how many henry should i use? I like your work.From last year I was working on this project with lot of modification. But I was facing a serious issue during my test.The problem is that MOSFET Q3 burned when I connect the charger to battery terminal.Still now I am working on it but not able to solve it.Hope you may help me. is it okay if i use this mosfet? i cant find the 60v 30a, but only the 55v 30a IRFIZ44. do i need to modify the circuit if i use this mosfet? Could some one please send me the complete Sowtware Set ?? Thanks for your help . Hi, The link to your PCB files for the charge controller is dead, please can you repost them or send them to me?Thanks! i still have some of the PCBs left over. We also had been running into problems with blowing FETs. While working on another solar power project we used another algorithm and supposed that there is a problem with the original Tim Nolan algorithm. We used this first at our project and it caused some funny things. The plan was to use the new algorithm at this project to, but…..